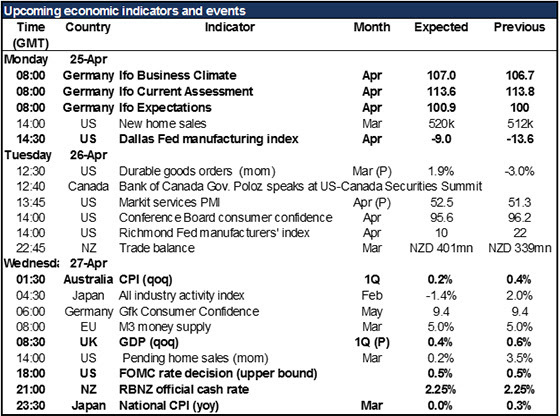 FOMC, BoJ, RBNZ, GDP and inflation data; Ifo – A very busy week for the markets, featuring three major central bank meetings (FOMC, Bank of Japan and RBNZ), several countries’ Q1 GDP data, and the CPI data from a number of countries. On the other hand, we’re relatively low on speakers this week, with only one Fed speaker on Friday to tell us what Wednesday’s decision actually means. The FOMC will be the highlight of the week and it won’t be. On the one hand, the market puts zero (0.0%) probability of a hike at this meeting, and I wouldn’t argue with that. Moreover, there’s no press conference afterwards, nor is anyone allowed to speak until Friday. All we’ll have to go on is the statement. Given that the market has heard a number of generally dovish Fed speakers recently, I would expect even a neutral Fed statement to cause the market to push up the likelihood of a June rate hike (currently only 21%), thereby proving USD-positive. There’s much more debate and anticipation about the BoJ meeting. Bloomberg’s survey of forecasters showed that almost everyone – 40 out of 41 – expects some policy change by the end of the year, with 23 expecting it at this meeting. As for what they might do, the domestic reaction to negative interest rates has been, well, negative, and they are already buying up most of the JGB issuance. It was reported on Friday that they are considering a lending facility for banks with negative rates, much like the ECB’s TLTRO2 program. If that’s all there is, then there will probably be a “buy the rumour, sell the fact” reaction and the yen could strengthen. The RBNZ rate decision, coming as it will only 3 hours after the FOMC, may get lost in the general market activity. Nonetheless the market is attributing about a 50-50 chance of a cut, so there is likely to be good volatility no matter what the decision is. The currency has strengthened since the last meeting, but as in Australia, commodity prices (dairy, specifically) have strengthened too. Meanwhile, the government has been exerting pressure on Gov. Wheeler to get inflation up. I would expect no change in rates but a definite easing bias and comments about the NZD that leave the currency weaker.